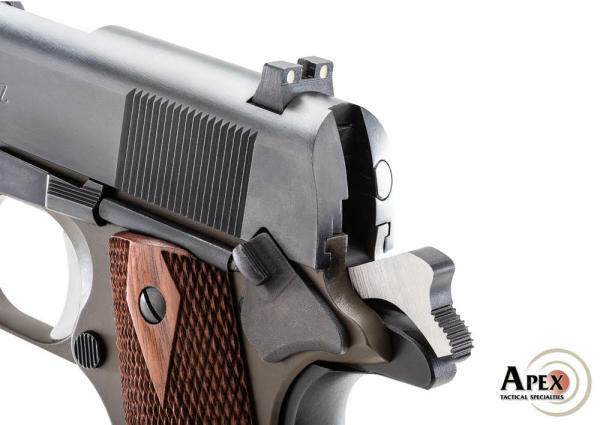 Apex Tactical Specialties is pleased to announce the release and immediate availability of its precision made performance hammers for the 1911. Designed by Apex Founder and Master Gunsmith Randy Lee, the new 1911 hammers are based on the key hook geometry of a 50-year-old National Match Government model 1911 and features a hook height that is .018” to .020” to provide a consistent, clean breaking trigger pull. Manufactured from heat-treated A-2 tool steel, the hammers are precisely cut on a wire EDM for dimensional consistency and perfectly square hammer hooks. The result is a hook profile that requires no stoning or polishing for performance. Apex is offering two versions of the hammer. The Classic Spur-style (part# 106-110) and the Commander-style (part# 106-111). When paired with a premium sear, the trigger pull will be in the 3.5 to 4.0 lbs range but easily tuned to a lower weight for competition use. The new Apex 1911 Hammers can be ordered direct from ApexTactical.com. Retailers and wholesale distributors that have not yet ordered and wish to stock the new hammers can contact Apex at dealer@apextactical.com or (623) 322-0200 for pricing and quantity availability. For more information on parts from Apex Tactical Specialties, visit www.ApexTactical.com, like Apex Tactical on Facebook or follow @ApexTactical on Instagram or Twitter. Instructional videos on the installation of Apex parts are available on Apex's YouTube channel.